Rod Dreher's report on "crunchy conservatives." A strange thing happened to Rod Dreher in the summer of 2002. From the bowels of the modern conservative movement itself, he, a young writer for the National Review, published an online column that rang out as a call-to-arms. 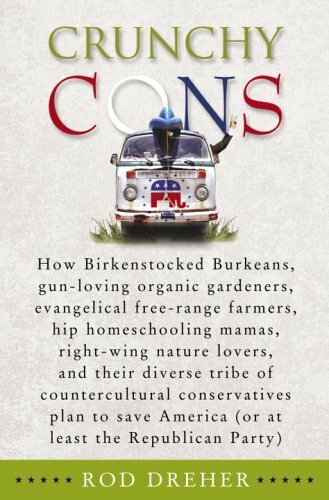 In "Birkenstocked Burkeans: Confessions of a Granola Conservative," Dreher disclosed that he and his wife "have more in common with left-wing counterculturalists than with many garden-variety conservatives." Among the tell-tale signs were a taste for organic food, a deep suspicion of big business, and a conviction that environmental conservation is a great good. "Somebody's got to pioneer these things" on the Right, he declared. "Dare to dream, you Birkenstocked Burkeans, and pass the hippie carrots." They did more than dreamthey deluged him with email. The article sped through cyberspace and into the homes of thousands of like-minded folk, leading Dreher, less than four years later, to enlarge his modest column into a pop manifesto, Crunchy Cons, with a subtitle that parodies the bombast you can find on thousands of book-jackets these days. The subtitle is more than cuteit's instructive. Dreher, now an editor at the Dallas Morning News, seeks to use all of his considerable charm and wit to provide ballast for a movement he's discovered to be well underway. As the subtitle's mock-grandiosity hints, though, it's not the usual political movement for which and to which he's trying to speak. Rather than outlining a policy driven program, he's sketching "a sensibility, an attitude, a fundamental stance toward reality," one that might lead more and more toward a "secession of sorts from the mainstream" in order to "conserve those things that give our lives real weight and meaning."